For this month’s Reading Readers blog, PhD student Felicity McWilliams (a familiar face at MERL) gives us an insight into how the MERL collections are playing a part in her research of draught power technology in the 20th century. 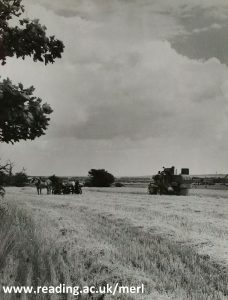 An image from Farmers Weekly showing horses and a combine harvester at work together on a farm near Durham in 1961. The farmer also used tractors but on this day they were busy on another task (MERL P FW PH2/C107/76). Last September, I left my post as Project Officer at the Museum to embark upon an AHRC-funded Collaborative Doctoral Award PhD, based jointly at King’s College London and here at MERL. I’m researching the history of draught power technology on British farms c.1920–1970. Draught power is essentially anything used to pull a load, from carts and wagons to ploughs and harvesters. I’ll admit I often get a blank look back when saying that, though, so I revert to telling people I’m doing a PhD on tractors. It’s not just tractors though; the technological landscape of twentieth-century British farms included steam engines, horses, oxen, home-made tractors, cars, lorries, jeeps, motorcycles and even military-surplus tanks. Histories of agricultural technology (and of technology in general) have tended to focus on new machinery and innovation. Which is fine, but it means that they look mostly at manufacturers, economics and government policy and rarely at the people actually using the technology – the farmers, horsemen, tractor drivers and farm mechanics. The aim of my project is to research the wide variety of draught power sources that farmers were using and the factors that influenced their decision-making. What they could afford to buy is always important, but I’m also interested to find out how their technological skills, working relationships, values and attitudes might also have had an impact on the animals and/or machines they chose to work with. 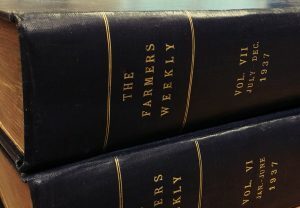 Back issues of The Farmers Weekly in the museum’s library. I’ve started by looking at the Second World War period, and over the past few months have spent a lot of time in the MERL archives reading 1940s issues of Farmers Weekly magazine. There are so many features in the magazine which help to show what farmers were thinking, discussing and buying, from adverts and articles to letters and photographs. In fact, there are so many amazing sources in the MERL archives, from films to farm diaries, that it’s a little daunting wondering how I’m ever going to find time to see everything. You can find out more about what’s in the collection here. We’ll certainly keep up to date with Felicity’s progress and hopefully share some of the interesting things she discovers in her research. World Hunger Day: Where does MERL fit in? Written by Science Engagement Officer, Robyn Hopcroft. Saturday, 28 May is World Hunger Day. It’s a chance to consider and act to create sustainable solutions to hunger and poverty. MERL is a museum “dedicated to the spirit of the English countryside and its people”. So what do we care about world hunger? Well, we care about farming, which means we are interested in food production and we want to talk about where that food goes and how local food chains figure in concerns about global food security. So, for instance, we are interested when we hear that 15 million tonnes of food and drink was wasted in the UK food chain in 2013 [pdf] and yet some 793 million people around the world are undernourished. “But your collections are so old!” I hear you say, “What relevance do they have to our lives now and in the future? How do they relate to what is going in other parts of the world?” Well I’m glad you asked! Our historical collections provide an excellent opportunity to learn from the past and think about what worked, what didn’t work, and make comparisons to how we do things today. As an academic museum, our collections are important tools for teaching and research, which can feed into future policy and practices. This World Hunger Day the focus is on nutrition, and at MERL we hold the Hugh Sinclair archive – a collection that contains an important body of nutritional data. Hugh Macdonald Sinclair (1910-1990) was a pioneer in the field of human nutrition research, and is known for his bold self-experimentation with the Eskimo diet. (He survived on a diet of seal and fish for 100 days.) But it’s Sinclair’s 1940s work on the Oxford Nutrition Survey (ONS) that has relevance to the scientific study of malnutrition. The ONS examined the diets of a wide range of people including pregnant women, students and manual workers. The resulting data was a useful tool to help ensure that rationing levels were adequate for the population. Survey work was also conducted with malnourished people in the British occupied areas of Germany and The Netherlands after World War II. So here we are at MERL, holding a valuable resource that gives us a window into the past, and that could also be used to help us understand and combat malnutrition today. 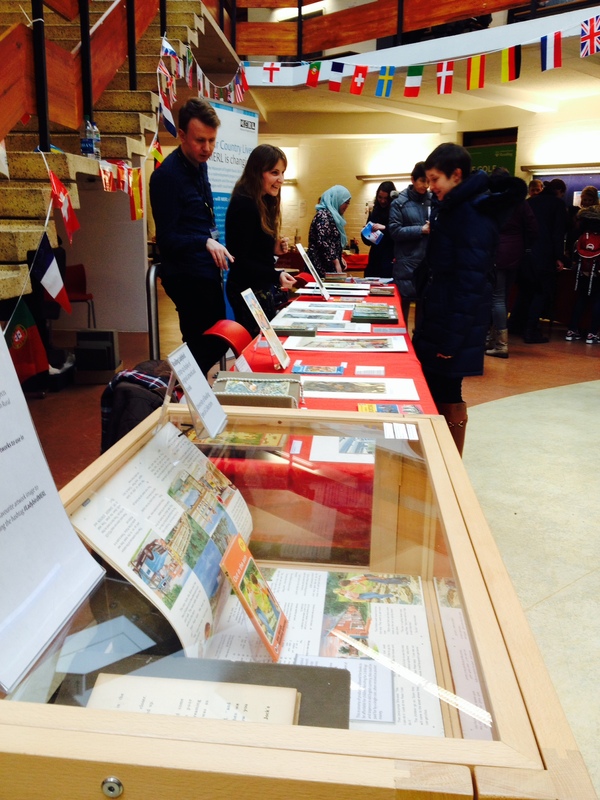 To complement our collections, we will also be out and about running some participatory activities. 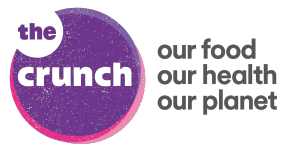 I’ve signed up as an ambassador for The Crunch – a Wellcome Trust initiative that aims to inspire everyone to consider the connections between our food, our health and our planet, so that we can all help create the recipe for a happier, healthier future. I can’t wait to get chatting to people about food and nutrition and some of the obstacles we face to ensure that we can feed a growing population. Our first outing using The Crunch resources will be at the University of Reading’s ‘Big Band Lunch’ on Sunday, 5 June. We want to encourage visitors to play some traditional fete games, but also to try something new with food. Perhaps have a taste of some cricket-flour brownies and consider the pressing need to find sustainable protein sources? Or try to feed a city with sustainable and healthy food by playing the Hungry City game? What? This display will showcase a selection of important archive materials and books from the Landscape Institute collections, including rare books dating from sixteenth century to the present day. 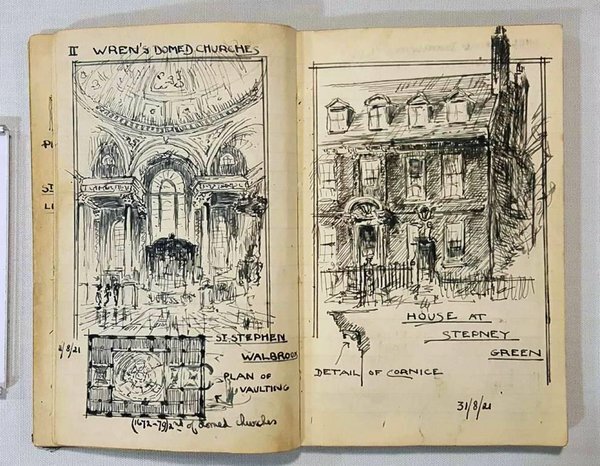 See stunning sketch books, fascinating photographs and beautifully illustrated book plates and fold out plans. 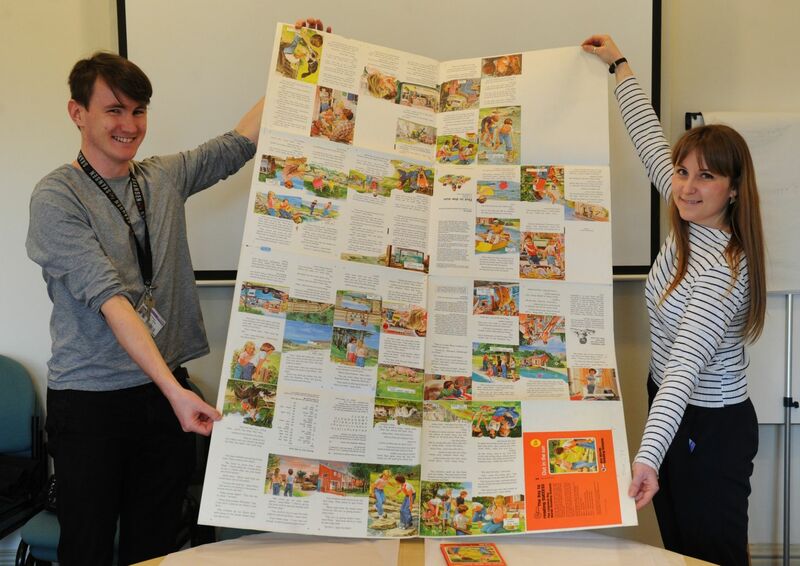 We’re very pleased to report that this exhibition has gone on tour to the University Library. So what are you waiting for? Visit the exhibition and take this special opportunity to explore our Landscape Institute collections with us. As ever contact us on merl@reading.ac.uk for further information or click here. Chalk or Cheese? Winner announced! 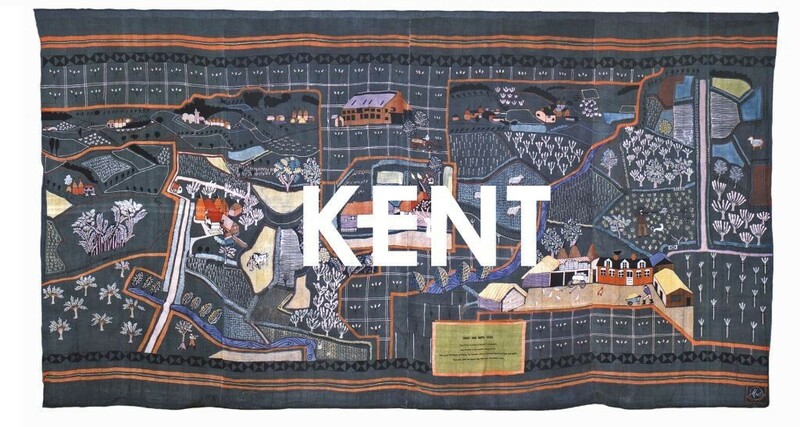 The votes are in, the people have spoken and the wall hanging chosen for display in the new Museum of English Rural Life is…Kent! Over the past month we asked you to vote between our Kent and Cheshire wall hangings, two of a series of seven made by the artist Michael O’Connell for the 1951 Festival of Britain. 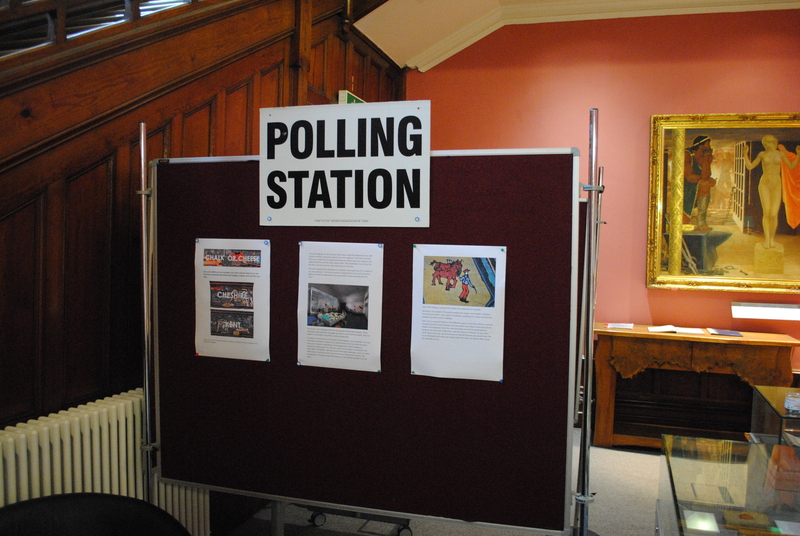 The campaign culminated in our Museums at Night event, Chalk or Cheese?, where visitors enjoyed each region’s beer and cheese, advocates for both hangings battled it out in a political hustings and everyone had to chance to participate in a secret ballot. The end-vote was incredibly close; in the end, Kent only won by six votes. If you’re wondering why the choice is only between two wall hangings, the reasons are actually quite simple (the others depict Rutlandshire, Scotland and Wales, Northern Ireland, Yorkshire and The Fens). Firstly, we have never had the space or right conditions to display any of these hangings before, so they’ve lain in our Object Store for decades. The cost of conserving each hanging for public display was significant and involved considerable work on the part of qualified conservator Kate Gill. We could not have done this without the funding the Heritage Lottery Fund and the University provided. 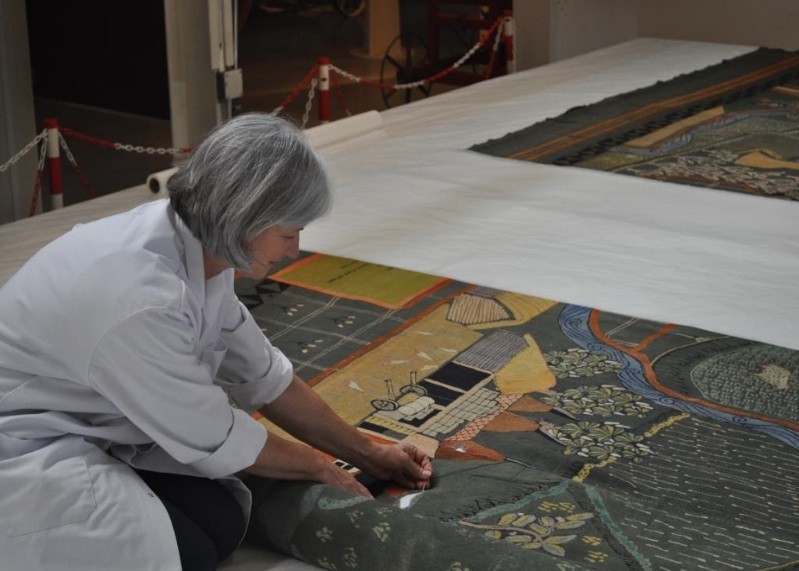 She removed creases in the fabric, repaired damage, and cleaned and reshaped each of them ready for display. Kate Gill conserving the wall hangings. It’s actually quite lucky that the wall hangings have not been on display in so long, as it means their colours are fresh and vibrant. To keep the colours that way we have to avoid exposing them to too much light, so each wall hanging will only be displayed for five years at a time. One wall hanging will be fully displayed while the other will be rolled and stored at the back of the case, ready to be swapped around in five year’s time. This of course means that the Cheshire wall hanging will go on display in 2021. We’d love to be able to display them all at the same time, but at a mammoth 7 x 3.5 metres each, we simply cannot afford to case them all (and we don’t have the space!). The case we have bought is bespoke, and has been carefully designed specifically for our wall hangings. 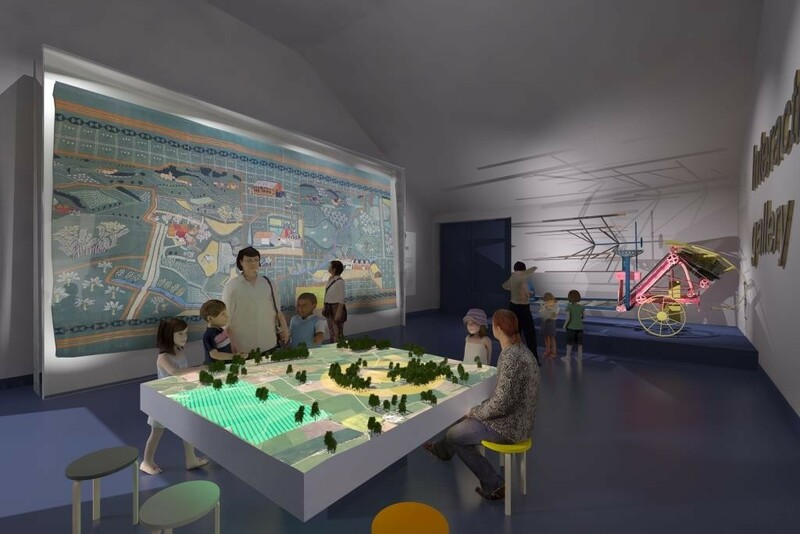 An artist’s impression of what the new gallery may look like. Of course, conservation and environmental factors were less of a concern to our predecessors when they first acquired the hangings back in 1952. They took them immediately to an agricultural show and hung them in the back of a tent in the middle of a field. How times (and costs) have changed! Thank you to everyone who voted in this campaign, and we look forward to inviting you to see the wall hanging on display this October! Volunteer, Whitney continues her series of interviews with members of staff with a chat with Jacqueline Winston-Silk, Art Collections Officer, about her role. 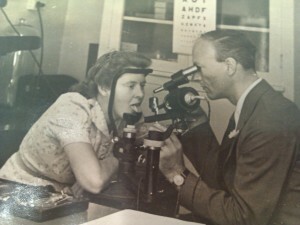 Can you give me a little background of the work you do here at MERL? I am based at the Museum and employed by the University of Reading. I manage the University’s Art Collections as a whole and I am also responsible for artworks that are held at MERL and within Special Collections. Managing and advocating for the University’s Art Collections. 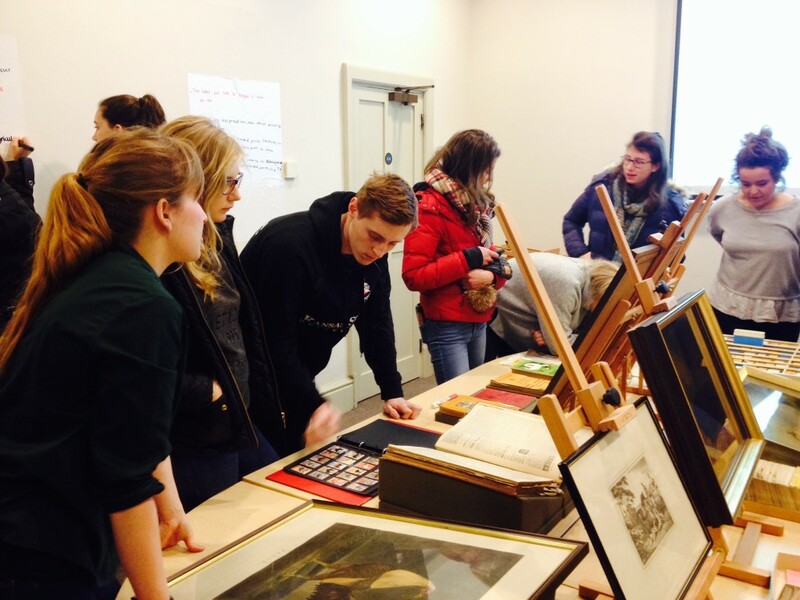 Developing the collections and making artworks accessible and relevant to students, academics and the public. I also have to think strategically in terms of exploiting the Art Collections to provide value and research potential for the University. Historically, no one has held the single responsibility for the Art Collections. Because of this I feel the collections have not been used to their full potential. The majority of our students and visitors may not be aware of the extent of the art collections because we do not currently have an online collections database to search – like there is for other University of Reading collections. Therefore, to address the identity and visibility of the Art Collections we are embarking on a collections audit. Our aim is to research, digitise and catalogue the entire collection. Ultimately, it is a process of establishing what we have and where it is! As we do this, we can increase the ways our audiences gain knowledge and enjoyment from the collections – whether within teaching and learning, or through programmes of displays and events. At the moment I’m involved in numerous projects. Aside from the retrospective cataloguing and research project, I’m delivering an events programme called Art Collections in Conversation; I’m working collaboratively to produce a Ladybird Gallery as part of the Museum’s redevelopment, and I’m supporting an exchange programme where the University is hosting a number of artists in residence. In partnership with the Collections Officer I support loans administration and registrar work for the museum. We have an active social media presence so I contribute content for this; I’m also responsible for writing and supporting funding bids, and sorting out tricky things like copyright permissions. I also support the development of 2 young volunteers. It’s a hugely varied job which I love! Ten years ago I completed a BA (Hons) in Photographic Arts and about 4 years ago I did an MA in Museum Studies. Whitney: So your course gave you some knowledge for what you are doing now. Jacqui: Yes, but I don’t think you necessarily need a Master’s degree to work in a Museum. I feel that having a postgraduate qualification in Museum Studies or a cultural heritage subject demonstrates commitment to your future profession, and it taught me a lot about museums. But at the same time there are a number of people that might not have the opportunity to do a Master’s programme. Some people choose internships and vocational placements and enter their museum career completely differently, still achieving the same thing. Now that I’m in this position, I often feel that practical skills can be more valuable. You studied Photographic Arts as a BA. Has art always been a passion of yours? Photography has always been something I’ve been interested in. It’s just something I’ve always loved. Once I did my BA I became more aware of the role of the museums and galleries. Material culture, cultural heritage and history are passions. As an Art Collections Officer are you responsible for collecting Art pieces at all? We have an acquisitions policy that governs when we acquire an artwork or object. We’re not actively collecting art because we’ve got quite a lot already! It’s about understanding, researching and using the collections that we have. However, there will always be opportunities that arise to purchase something new, or to receive a gift or donation. For example, I was recently involved in acquiring some works for the Museum. Do you work solely as an Art Collections Officer or do you liaise with other departments and work with other colleagues at MERL? I get asked to do lots of different things by different people. Rob, the Volunteer Coordinator or Philippa, the Audience Development Manager might approach me and say, “We’re doing this session, what collections do you recommend we use?” or “Can you come in and give a talk?” I am also working with the team at MERL, for example with Caroline the Deputy Archivist and with Ollie the Assistant Curator, to curate a display of artwork within our new Ladybird Gallery. This is part of the wider Our Country Lives redevelopment. Museum work often necessitates collaborative working and relying on curatorial expertise of your colleagues. Do you think that has helped you understand the vision of what you need to accomplish and understand the bigger picture? Yes, there’s definitely a bigger picture. The students are central to my role and giving them greater access to the resources that we have is the bigger picture which trickles down into much smaller ventures, whether it be just giving a seminar or working with Director of Museum Studies, Dr Rhi Smith, on a pop-up display. How has your experience been at MERL? Is it different to any other institution you have worked in before? Because of the museum’s extensive and ambitious redevelopment project, it has been an excellent time to join the team. I started at MERL in September 2015. Before that I was at Camberwell College of Arts, and prior to that I was at the Museum of Domestic Design & Architecture. For the past couple of years I have been working with University collections, so I am used to the emphasis on the student, in addition to the traditional museum audience. What are the rewarding aspects to your job? I feel privileged to have access to different types of objects, collections and archives and I expect that’s something that all Curators or Collection Managers feel, because that’s probably what gives us our kicks! When you’re working for a University, the world of academia can sometimes be a little intimidating. You’re often working with a lot of very experienced people. On the plus side, it means you’re working with experts in the field so you’ve got an amazing resource. How do you think digital technology might change your role or job description in the next coming years? I think it will definitely change some of the ways that we work and will present new opportunities. The University’s Ure Museum is digitally scanning and printing objects in their collections. Digital platforms present a huge opportunity to engage people with the art collections, at a time when the University doesn’t have a traditional gallery space. It enables us to think imaginatively about how we present the collections online. Digital tools can also aid collections management work, although we don’t currently use them, there are smart phone devices which can assist with tracking object relocations. There are lots of ways that new technologies will change, challenge and enhance the way museums work. Whitney: So do you think galleries will become much more visual and visible? Jacqui: Yes. It definitely presents new opportunities. It may mean in the future that you have Curators that specialise in digital technologies and engagement. But you also can’t deny the fact that you are still going to have a physical, historic collection to look after. Whitney: Is that daunting to think about? Jacqui: As a bit of a traditionalist and an advocate of analogue technologies and approaches, I find it daunting that in the future a greater emphasis could be placed on the digital rather than the physical. Whitney and Jacqui continue their fascinating conversation next week!